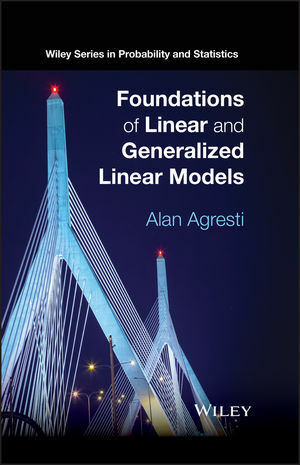 Written by a highly-experienced author, Foundations of Linear and Generalized Linear Models is a clear and comprehensive guide to the key concepts and results of linearstatistical models. The book presents a broad, in-depth overview of the most commonly usedstatistical models by discussing the theory underlying the models, R software applications,and examples with crafted models to elucidate key ideas and promote practical modelbuilding. An invaluable textbook for upper-undergraduate and graduate-level students in statistics and biostatistics courses, Foundations of Linear and Generalized Linear Models is also an excellent reference for practicing statisticians and biostatisticians, as well as anyone who is interested in learning about the most important statistical models for analyzing data. ALAN AGRESTI, PhD, is Distinguished Professor Emeritus in the Department of Statistics at the University of Florida. He has presented short courses on generalized linear models and categorical data methods in more than 30 countries. The author of over 200 journal articles, Dr. Agresti is also the author of Categorical Data Analysis, Third Edition, Analysis of Ordinal Categorical Data, Second Edition, and An Introduction to Categorical Data Analysis, Second Edition, all published by Wiley. "The book arose from a one-semester graduate level course taught by Alan Agresti at Harvard University. It has a clear didactic focus, which benefits greatly from Agresti’s well-known clear writing style. Each of the 11 chapters is followed by around 40 exercises, which are diverse and interesting." "...I am very happy with the foundational perspective of this book. I think that students who master this material will have a very thorough understanding of the most important aspects of GLMs, which is more valuable than a kaleidoscopic knowledge. This is certainly one of the books I will consider when next I need to teach a course in generalized linear models." "...this is a great introduction to GLMs written in a clear and didactic style, and with a thoughtful choice and presentation of the material. Highly recommended."